The ACS Scientific Step-Pak™ Modular Motion Control System is used in laboratory environments around the world as an ideal solution for flexible multi-axis stepping and servo motor motion control. Step-Pak™ stepping motor drivers and servo amplifiers are specifically designed to generate very low levels of radiated electrical noise so as not to impair accurate readings from scientific instruments. The Step-Pak™ Modular Motion Control System allows researchers the flexibility to add axis of motor drive and motion control as needed, and quickly replace driver modules as motor configurations change. 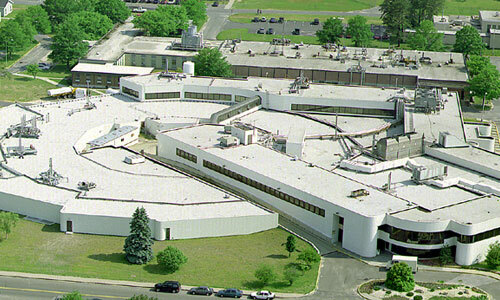 Dependable, durable, low noise generating motion control systems for demanding synchrotron environments. Modular motion control systems, motor amplifiers & power supplies that conform to laboratory needs and budget. 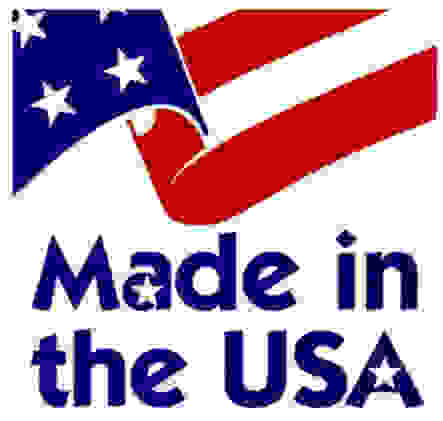 Customer demand driven and application specific new product & solution development. The Step-Pak Modular Motion Control System. Your system, your specification, your motor type on your budget. 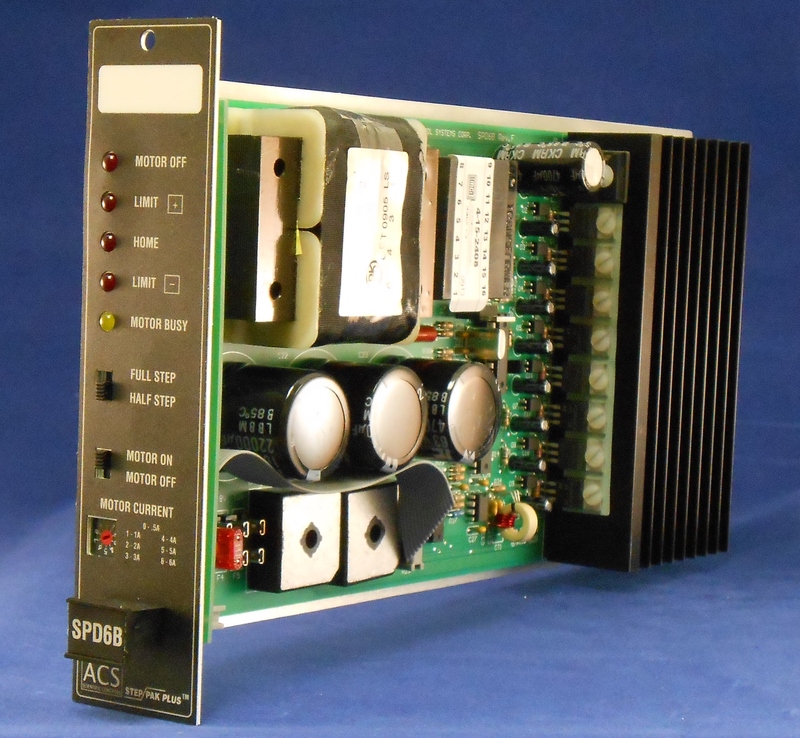 The ACS Scientific MCB & SMC Series Integrated Stepping Motor Driver/Controllers allow for easy drive and control for up to four motors from a single board. 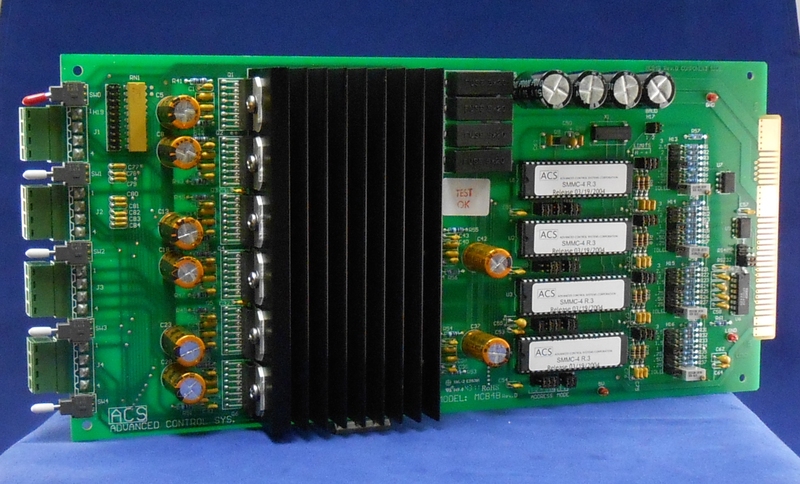 Up to 8 MCB boards in a 19" rack can provide addressable drive and control for up up 32 motors. The ACS Scientific Step-Pak™ Modular Motion Control System is used in laboratory and industrial environments around the world as an ideal solution for modular, flexible multi-axis stepping and servo motor drive and control. The ACS Scientific MCR Series Integrated Stepping Motor Driver/Controllers provide simple rack or table mount 4 or 8 axis stepping motor power, drive and programmable control for a weath of applications. Ethernet communications make networking quick and easy. 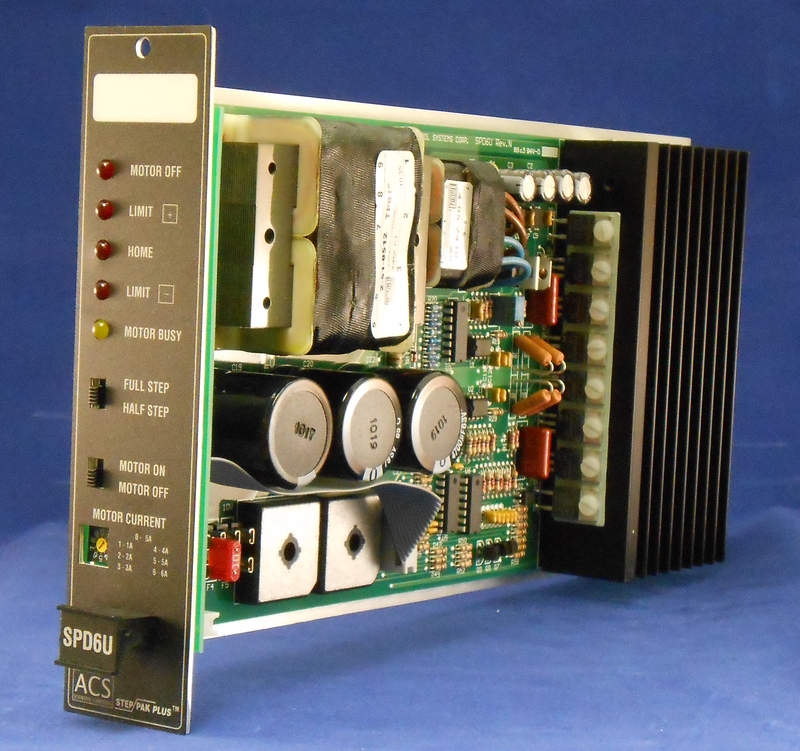 All ACS Scientific Controllers, Motor Drivers, Servo Amplifiers, Interface Modules and Power Supplies are designed, developed, manufactured and assembled with great care, quality and efficiency at our facilities in the United States of America. The Step-Pak™ SPI-8 Indexer Module is an 8 Channel indexer/controller that plugs into the Step-Pak Equipment Rack. The controller provides step and direction input for up to 8 stepping motor drive modules plugged into the Step-Pak enclosure. Home, Limit + and Limit - inputs are available for each channel. 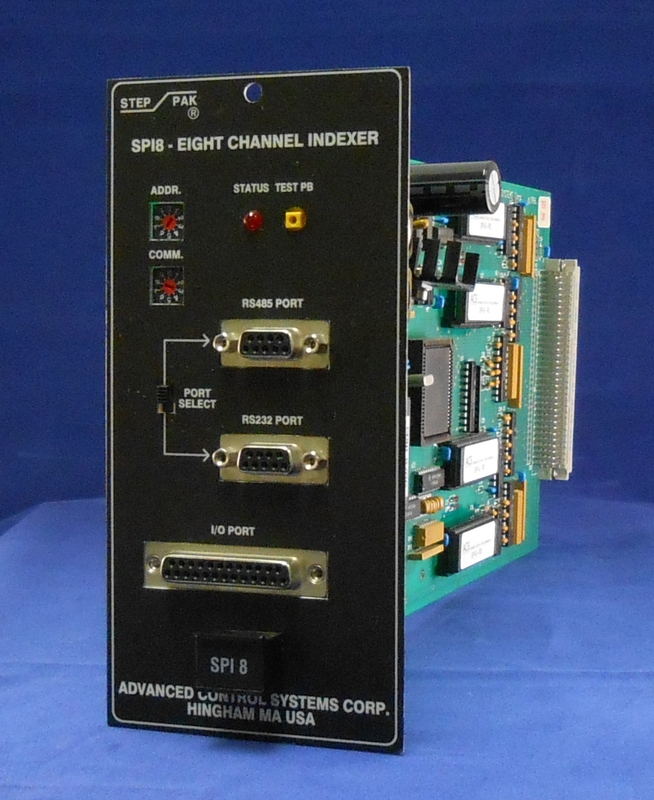 The SPI-8 also supports 8 status and eight control outputs available via front panel connectors. Communications with the host computer is via RS-232 or RS-485 communications. The Step-Pak™ SPD-6B Stepping Motor Driver is a high efficiency, high performance motor driver. The engineered bi-polar, bi-level design provides absolutely minimum motor and driver losses which result in cool running motors and drivers, enabling high density packaging of equipment. Low DC voltage is applied to the motor windings when the motor is positioned. High voltage is applied synchronously with motor steps for fast acceleration and high running torque. Most of the switching losses inherent in chopper type drives is eliminated resulting in cooler running motors. The bi-level motor drive produces very low levels of radiated electrical noise which is critical during scientific data collection. When the motor is held at position, no currents are interrupted, therefore there are no radiated electromagnetic fields to interfere with measurements. 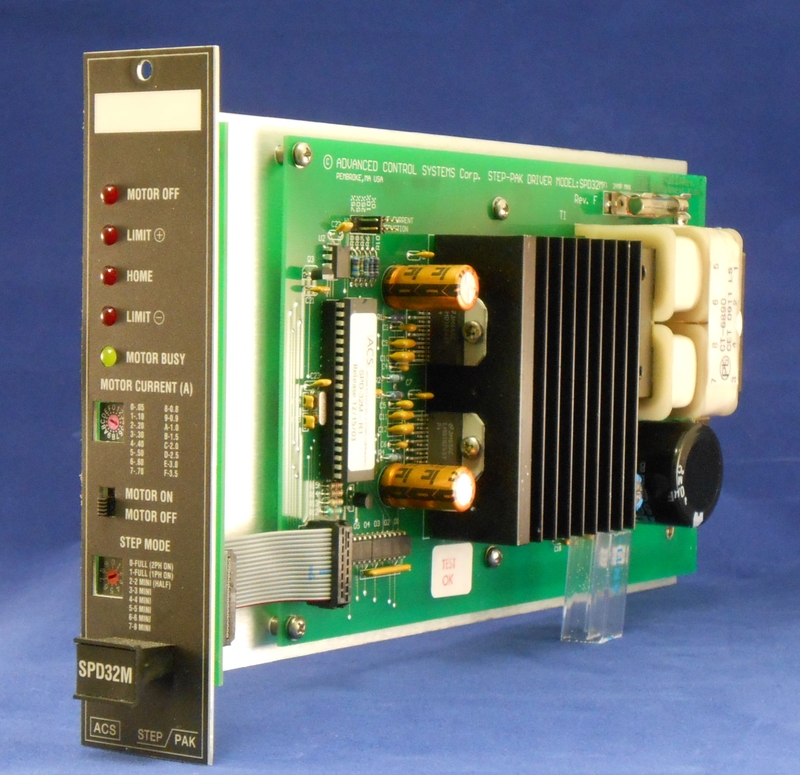 The Step-Pak™ SPD-32M Stepping Motor Driver is bi-polar, low noise, chopper type driver with mini-stepping capability. The two-phase, bi-level design is highly efficient and promotes cool running of motors and drivers, enabling high density packaging of equipment. Motor windings are compared to preset values. When motor current reaches the preset value, it is turned off and starts decaying to a preset low value when it is turned on again. When the motor is held in position, some low level switching electrical noise is generated. 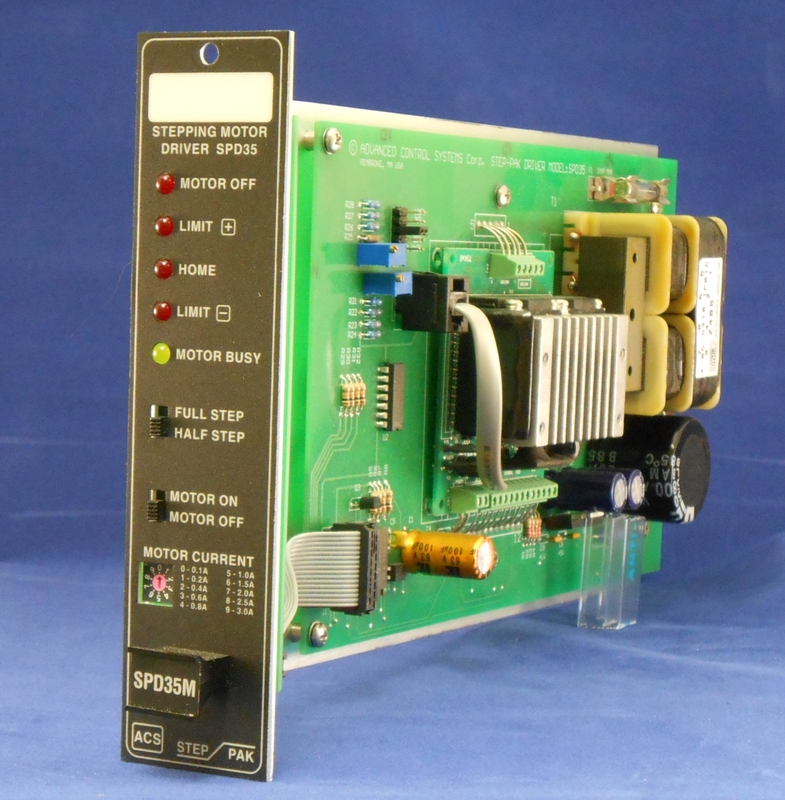 The Step-Pak™ SPD-35 Stepping Motor Driver is bi-polar, low noise, chopper type driver specifically designed to drive 5-Phase stepping motors of Pentagon winding configuration. The two-phase, bi-level design is highly efficient and promotes cool running of motors and drivers, enabling high density packaging of equipment. Motor windings are compared to preset values. When motor current reaches the preset value, it is turned off and starts decaying to a preset low value when it is turned on again. When the motor is held in position, some low level switching electrical noise is generated. The Step-Pak SPD-5F Stepping Motor Driver is a high efficiency, high performance motor driver. The SPD-5F can drive any 3, 4 or 5 phase motor. The engineered uni-polar, bi-level design provides absolutely minimum motor and driver losses which result in cool running motors and drivers, enabling high density packaging of equipment. Low DC voltage is applied to the motor windings when the motor is positioned. High voltage is applied synchronously with motor steps for fast acceleration and high running torque. Most of the switching losses inherent in chopper type drives is eliminated resulting in cooler running motors. The bi-level motor drive produces very low levels of radiated electrical noise which is critical during scientific data collection. When the motor is held at position, no currents are interrupted, therefore there are no radiated electromagnetic fields to interfere with measurements. The Step-Pak SPD-6U Stepping Motor Driver is a high efficiency, high performance motor driver. The engineered uni-polar, bi-level design provides absolutely minimum motor and driver losses which result in cool running motors and drivers, enabling high density packaging of equipment. Low DC voltage is applied to the motor windings when the motor is positioned. High voltage is applied synchronously with motor steps for fast acceleration and high running torque. Most of the switching losses inherent in chopper type drives is eliminated resulting in cooler running motors. The bi-level motor drive produces very low levels of radiated electrical noise which is critical during scientific data collection. When the motor is held at position, no currents are interrupted, therefore there are no radiated electromagnetic fields to interfere with measurements. The Step-Pak Plus™ SPS-20, 20 Watt Servo Amplifier is a 20W, single poll roll off analog amplifier for powering DC servo motors with the Step-Pak system. A smooth preamplifier conditions the primary power amplifier to deliver stable servo control with lowered amounts of radiated electromagnetic noise that can be detrimental to scientific data collection. * NOTE: The SPS-20 Servo Amplifier Module is only compatible with newer generation SPR-9 Plus Step-Pak Rack Systems. The SPR-9 Plus adds servo control lines to the traditional Step-Pak rack. All Step-Pak SPR-9 Racks purchased after January 2009 are Step-Pak Plus compliant. The Step-Pak Plus™ SPC-5 Interface Module provides 2 (two) 52-pin SCSII connectors for pin to pin direct connection to the Pro-Dex (OMS) MAXv-8000, 8-Axis VME Controller. 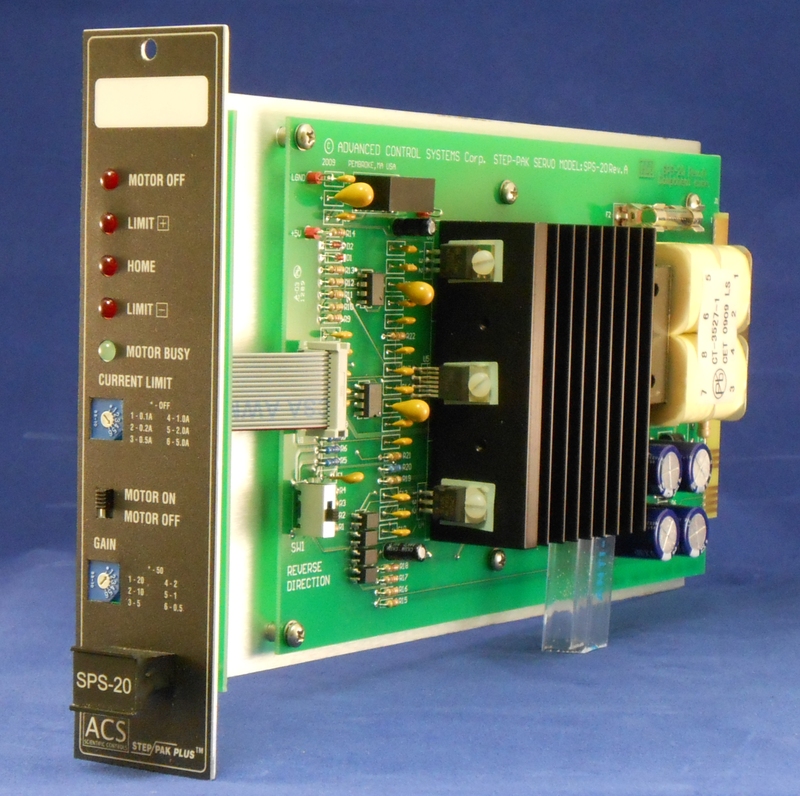 The SPC-5 Interface Module provides full Step-Pak stepper and servo module capability from the MAXv-8000. MAXv-8000 is a trademark of Pro-Dex, Inc. The Step-Pak™ SPC-4 Interface Module provides 8 (eight) RJ-45 front panel connectors for the connection of an external eight channel indexer or controller. The SPC-4 facilitates quick and easy system wiring through the use of standard modular jacks and cables. 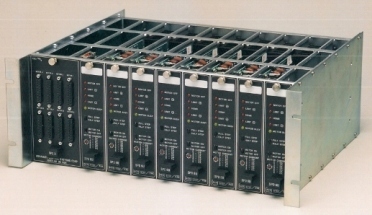 The Step-Pak™ SPC-3 Interface Module provides 8 (eight) DB-25 front panel connectors for the connection of an external eight channel indexer/controller. The SPC-3 provides differential receivers on step and direction inputs for all eight channels. Encoder outputs connected to the back panel of the SPR-9 rack are also brought to the front panel connectors. 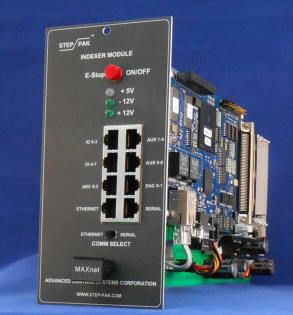 The Step-Pak™ SPC-2 Interface Module provides 3 front panel connectors for the connection of an external eight channel indexer/controller. Step and direction inputs are single ended and require 6mA sinking drivers. The Step-Pak™ SPC-1 Interface Module provides a direct interface to the Pro-Dex (OMS) VME-58-8S Controller. Differential receivers are used for connection to differential encoder outputs. A jumper option is provided for single board encoder outputs. VME-58-8S is a trademark of Pro-Dex, Inc. Copyright 2016. Advanced Control Systems Corporation. All Rights Reserved.